Headaches can be just one potential consequence of psychological stress and pressure from work, home, or personal life. The sensation is commonly experienced throughout the night as an accompaniment to night sweats. The experience of night sweats can be highly unpleasant, as in addition to its immediate effects, the phenomenon can disrupt sleep patterns and initiate lingering fatigue. Unfortunately, it is common for night sweats, and any accompanying headaches, to create a downward spiral that allows fatigue to snowball over consecutive nights. It is common for women to encounter more mental and physical stress than normal during menopause. In consequence, menopausal women are much more likely to experience night sweats and other related symptoms, such as headaches, than men. Fluctuating hormones have been identified as the most likely cause of night sweats and headaches during the menopause transition. While a woman progresses through menopause, perimenopause, or postmenopause, her body's hormone levels alter dramatically as they attempt to adjust to her changing reproductive system. While fluctuating hormones are most commonly responsible for night sweats and headaches, these symptoms might also indicate the existence of an underlying health condition. 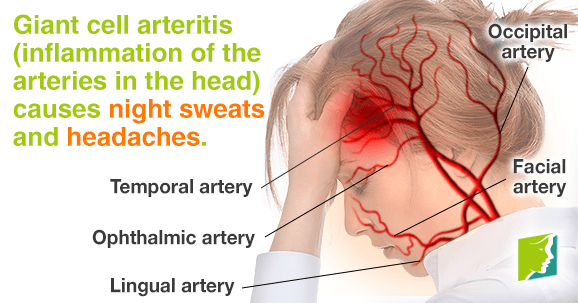 Which Medical Conditions Cause Night Sweats and Headaches? Sleep apnea. This is a sleep disorder characterized by pauses in breathing. Giant cell arteritis. This refers to inflammation of the head's arteries. Subdural hematoma. This serious condition is defined as bleeding across the surface of the brain. In order to rule out the threat of serious conditions, talking to a doctor about your symptoms is vital. Eating during early evening. While hunger and low blood sugar can provoke headaches, eating large meals late at night will also exacerbate the experience of headaches and night sweats. Drink plenty of water. Replacing the water night sweats cause you to lose is essential to retaining a healthy level. Exercise. Expending energy through engaging in regular exercise will help you to reduce stress levels and induce sleep. Get enough sleep. Maintaining a regular bedtime schedule is vital to ensuring you get the recommended amount of sleep. If you experience frequent night sweats, make sure you get to bed early so that the body has time to relax before sleep. Medications. Some medications can lead to headaches and night sweats. Discuss any possible side effects your medications could have with a doctor. Maintaining a healthy diet and exercise schedule is vital to ensuring that the body is capable of coping with the changes menopause throws at it. Some women find that alternative medicines - such as aromatherapy, natural supplements, and herbal teas - can all be beneficial when accompanied by lifestyle changes. Follow the link for more information on night sweat treatments. Boston Women's Health Collective. "Hot Flashes, Night Sweats and Sleep Disturbances". Our Bodies, Ourselves, 2006. Sweating is an unfortunate side affect of several menopause symptoms. Click here to learn more. Night sweats are one of the most common symptoms of menopause and cause a woman to wake up soaked in sweat. However, treatment is available.